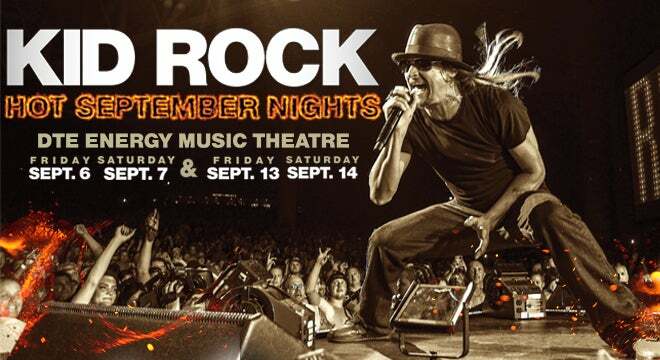 Kid Rock announces his return to DTE Energy Music Theatre with back-to-back weekend performances of “Hot September Nights” on September 6-7 and 13-14. Kid Rock Fan Club members get early access to purchase tickets, starting Tuesday April 2 10am. To Join the Fan Club go to kidrock.com/community. This limited run of shows are Kid Rock’s first Michigan concerts since he served as the kickoff artist for the grand opening of Little Caesars Arena in September 2017 with six sold-out performances. On the heels of this arena success, Kid Rock hit the road in 2018 in support of his first album fully recorded in Nashville, Sweet Southern Sugar, with two hugely successful tours – winter’s “American Rock n Roll” tour and summer’s “Red Blooded Rock n Roll Redneck Extravaganza.” The year also saw the release of his first ever greatest hits project Kid Rock Greatest Hits You Never Saw Coming. With 26 million albums sold to date, Kid Rock remains at the center of media attention in regard to his musical and personal ambitions, leaving his mark in a multitude of genres.